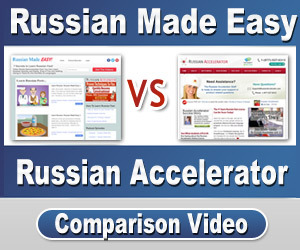 Alright, welcome to episode 11 of Russian Made Easy. Again, if you’re new to this podcast, it’s best to start with episode number 1 because each new installment assumes you’ve mastered all the previous material. That’s a tough pair of consonants at the start of that 2nd word…You have an N and a rolled R. That’s very hard to say slowly. Listen again, and also note how the emphasis is on the first syllable. Try making your own contextual phrase with this. For example: To me, vanilla is an okay flavor. So I’d say, мне нравится vanilla but I love chocolate. Hit pause and make your own. So, how would you translate mne nravitsa? This is a classic example of where we need to be very clear about the super literal meaning. Because, although mne nravita translates as “I like”, what you’re literally saying is, to me is pleasing. Let’s try it in a few sentences. Say.. Literally: To me is pleasing borscht. Again, literally: To me is pleasing pizza. Now you might be thinking…Wait! Why isn’t it pizzU, with an “uu” sound at the end? Doesn’t liking something count as doing something to it? WE’re not taking any action in the sentence at all. Grammar-wise, the pizza is the one doing the action. The pizza is pleasing us. After all, we’re not saying “Я”…Right? That’s the Russian word for “I”. Again, we’re saying МНЕ….to me. The pizza is the one doing the action. To me is pleasing caviar. Now say: I want caviar. See how we’re taking action in that last sentence? I want...YA hochu. Since we’re acting upon the caviar in that second sentence, that’s why we change it now to “ikru” (икру). So, MY started with an M — MOI. And YOUR started with a T — TVOI. Мне нравится рок а тебе нравится джаз. But how would you translate that phrase? Literally: To me is pleasing rock, whereas to you is pleasing jazz. Those aren’t actual sentences. I’m just comparing the “M” stuff versus the “T” stuff. Can you hear the difference? This is why I didn’t bring it up in Unit 4, because it’s so subtle. And even if you use the wrong one, a native speaker’s brain will still “hear” the right one. It will basically hear the one that it grammatically expects. But let me emphasize the difference, just so you’re aware of it. An “ee” sound in the first, an “ih” sound for that second, plural version. Listen one more time to the native speaker. So, from now on, whenever it’s not clear, I’ll point out whether we’re using the singular version of the plural version. But honestly, at conversational speed, the difference is almost non-existant except among speakers who really articulate everything they say. Hey, Sergei…do you like my friend Linda? Эй Сергей…Тебе нравится моя подруга Линда? Yes, she to me is pleasing. Hey Linda, do you like my friend Sergei? Эй Линда…Тебе нравится мой друг Сергей? Literally: Yes, he to me is pleasing. First, you recall how I mentioned you need to put an X on a card every time you get it wrong. The more X’s any card has, the more often you should test yourself on it. Well, at some point, you’ll have a small group of cards with lots of X’s, and a whole bunch of other cards that you always get right. So, the tip here is to re-write those most difficult ones onto a new card or two. I could usually fit six phrases on one side. Put that card consisting of your toughest phrases in your wallet and test yourself a lot. In the morning as your coffee is brewing, in line at the bank, when you’re filling up your tank, etc. The other follow-up tip here is to remember to go through your cards Russian side first from time to time. Read the Russian word or phrase out loud and then translate into English. I like to go to bars and have drinks with my buddies. My girlfriend, though, prefers to go to clubs and танцевать with her girlfriends. 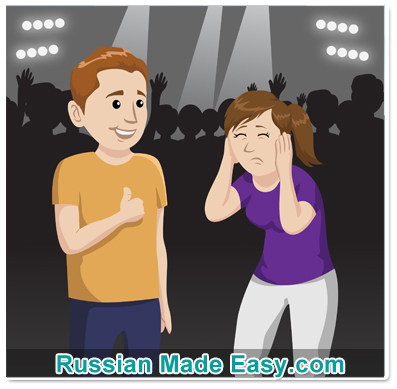 To move your body rhythmically to music is to танцевать. Ask your friend: Do you like to dance? Literally: To you is pleasing to dance? No. I don’t like to dance. Нет, мне не нравится танцевать. That’s a lot of “n”s isn’t it? Нет, мне не нравится танцевать. Say, Yes, I want to dance. And one more time, ask your friend..
Of course, please go to RussianMadeEasy.com to get the transcript of this podcast, and the audio downloads. And for homework, be sure to use this very important construction with as much of your vocabulary as you can fit in there. Practice saying and asking… Do you like yogurt? I like yogurt. I don’t like caviar. Do you like caviar? and so on. And of course, put in all your Russian Accelerator vocabulary too, of course. Next time we’ll take it a step further by learning to talk about the things we love. I’ll see you there! PS: That dance song is called “Zachem” by 5sta Family. Search Youtube…it’s a great video! And yes, you can definitely go through both at the same time. I hope this helps. And don’t hesitate with any questions.